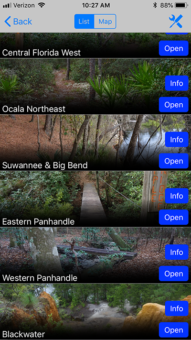 Download the Florida Trail app | Florida Hikes! 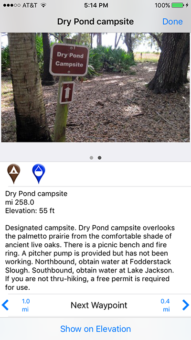 The Florida Trail Guide is also an app! Teaming up with Atlas Guides – who produce apps for the Appalachian Trail, Pacific Crest Trail, Colorado Trail, John Muir Trail, the Camino De Santiago, and more – we’ve taken the contents of our guidebook, added interactivity that’s impossible inside a book, presented it on a accurate map of the Florida Trail, and made it an interactive experience for planning your hikes. 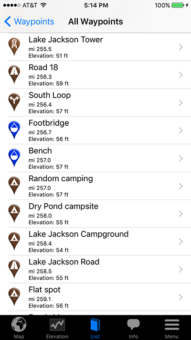 The Apple version magic is courtesy of Ryan Linn, otherwise known to the trail community as Guthook, who built a solid interface for app-based trail information, Guthook Guides. On the Android side, tech whiz Alice Bodnar wrangles Atlas Guides. You’ll find both versions under their respective app stores as Guthook Guides. Every hiking season, we’re out on the trail collecting updates for the app and guidebook. We do not rely on free government resources for our GPS data: we hike the trail. 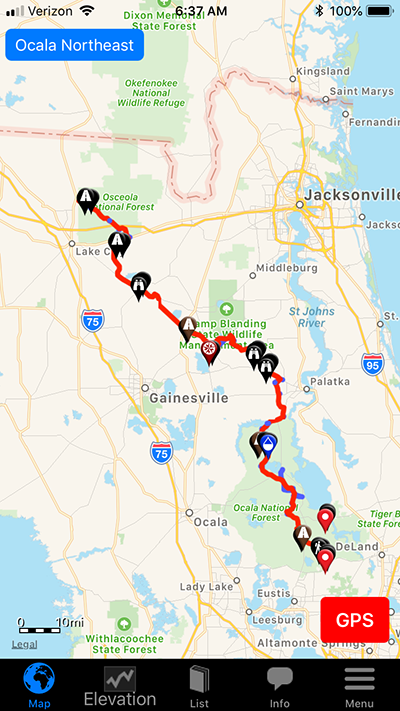 That’s the only way we can bring you thousands of waypoints with personalized notes and photos across more than 1,400 miles of the Florida Trail and its connected side trails. We are fortunate to have a good rapport with local volunteers and with the Florida Trail Association staff, who make sure we get updates for significant relocations of the trail during the year, and we’re thankful to be able to immediately pass those on to the programming team at Atlas Guides to splice them in so the location of the trail inside the app stays up to date. We then go out and hike those changes to the trail as our schedule permits. We do a big push every fall, before thru-hikers hit the trail in the winter, to gather together all of the emails, messages, notes, and feedback from hikers to push updates out about services and campsites. We also contribute a portion of the profits back into the Florida Trail, both through the Florida Trail Association and the Florida Trail Hikers Alliance. 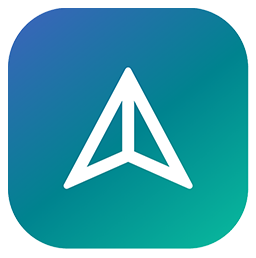 In 2017, the programming wizards at Atlas Guides launched new features for all of their apps, including the ability for you to record your own GPS track of your hike right inside the app as you hike and export it for your personal use. You can also keep personal notes on waypoints in addition to posting public notes for other hikers to see. A new “Go To” button lets you zoom right in to a specific mile marker along the trail, so when a social media post mentions “Nice swimming hole at mile 913!” you can zoom in to see what it is. And for those who want friends and family to follow along on your adventures, the app can share your location with them as well. Scroll through these updated screenshots to see some of what the app can do. 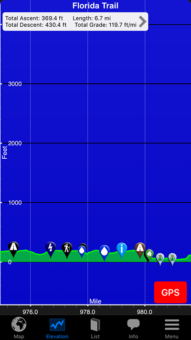 Elevation profile mode. Not so relevant in Florida. 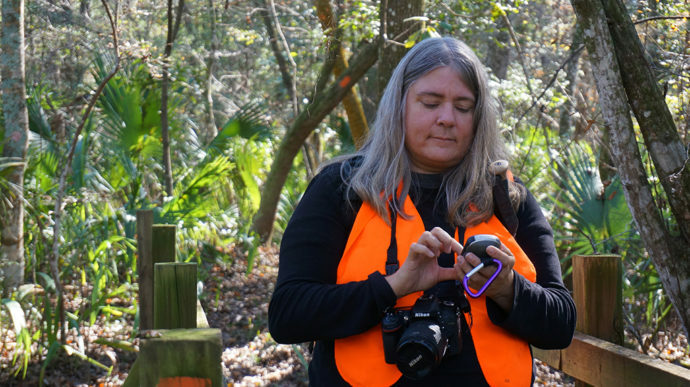 An awesome new feature in the Florida National Scenic Trail app is its ability to record your hike as a GPS track as you walk. We’ve found this to be a lifesaver when our Garmin GPS ran out of battery power while we were in the field. Now, we switch this app on to record the trails we hike and bike that appear here on FloridaHikes.com. Once you record a GPS track, you can download it to your computer or email it to yourself to make your own maps. 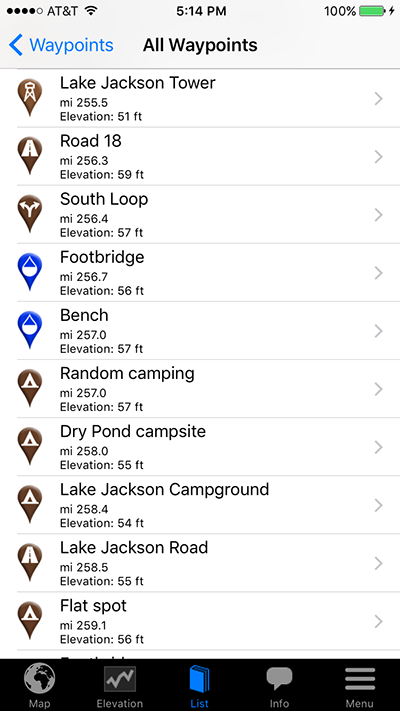 The Florida National Scenic Trail app inside the Guthook Guides app is free. It comes preloaded with the Blackwater region of the Florida Trail (45.4 miles) so you can try out all the features, and take a hike in one of our favorite areas. Other regions vary in price from $2.99 to $6.99, or you can buy the full “thru-hiker” set for $34.99, a 30% savings off purchasing the regions individually. Once you make a purchase, you receive future updates at no extra cost. SOUTH FLORIDA: Big Cypress, Seminole, and Okeechobee West, from Oasis Visitor Center to Okee-tantie. 150.7 miles. Also includes Okeechobee East (56.5 miles), the eastern route around Lake Okeechobee, which can be used in lieu of or together with Okeechobee West to loop the lake. OCEAN-TO-LAKE: Side trail connecting from Okeechobee East to the Atlantic Ocean, a great backpacking trip for Southeast Florida. 61.0 miles. CENTRAL FLORIDA: Kissimmee and Orlando sections, from Okee-tantie north to Clearwater Lake in the Ocala National Forest. Includes loops at Bull Creek and Tosohatchee. 257.7 miles. CENTRAL FLORIDA WEST: Also known as the Western Corridor. Roadwalk from Three Lakes to Green Swamp, Green Swamp East & West (includes Bigfoot BSA camp and other loops), Richloam, Croom, Citrus (including loops), Withlacoochee State Trail, Cross Florida Greenway, and Ocala West. 241.0 miles. OCALA NORTHEAST: Includes the Ocala and Northeast Florida sections, from Clearwater Lake north to Deep Creek trailhead at the north end of Osceola National Forest. 195.1 miles. SUWANNEE BIG BEND: Includes the Suwannee River section, private timberlands, Aucilla, and St. Marks NWR. 191.8 miles. EASTERN PANHANDLE: Includes the Apalachicola National Forest, Altha Trail, Econfina, Pine Log, Nokuse, and connecting roadwalks. 175.7 miles. WESTERN PANHANDLE: Includes Eglin Air Force Base, Yellow River Ravines, and Seashore. 130.5 miles. 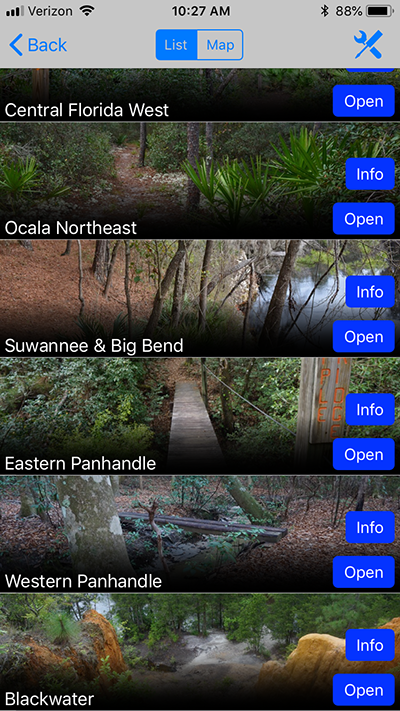 Our app to the Florida National Scenic Trail is one of many trail guides that Atlas Guides offers. The app works in airplane mode while you are hiking, saving a drain on your smartphone battery. Instead, it utilizes the built-in GPS of your phone to pinpoint where you are in relation to the Florida Trail. 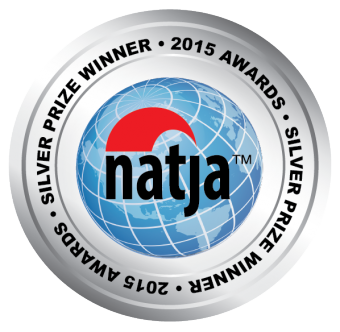 Choose from a map-based or data book interface, or use both! Use maps offline or online. Click-to-call phone numbers for trail services. 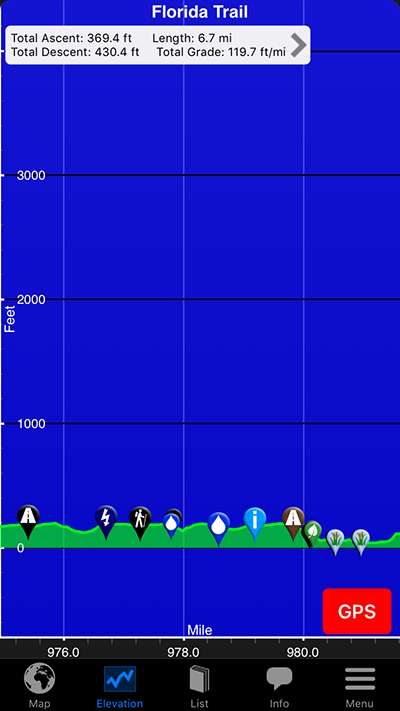 Automatic calculation of distance between next and previous waypoints, water sources, and campsites. Reverse Trail Direction switch for southbound mileage calculations. Share your current location while on the trail with friends and family via text or email. Draw your own route based on where you take a hike, and share that GPS track with friends. Save private notes on waypoints for later reference. 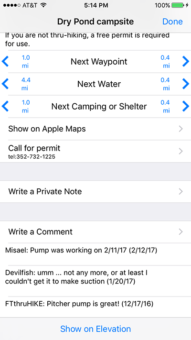 Hyperlinks let you connect to crucial information like requesting a permit, checking flood gauges along rivers, checking hunting season dates, and booking campsites. 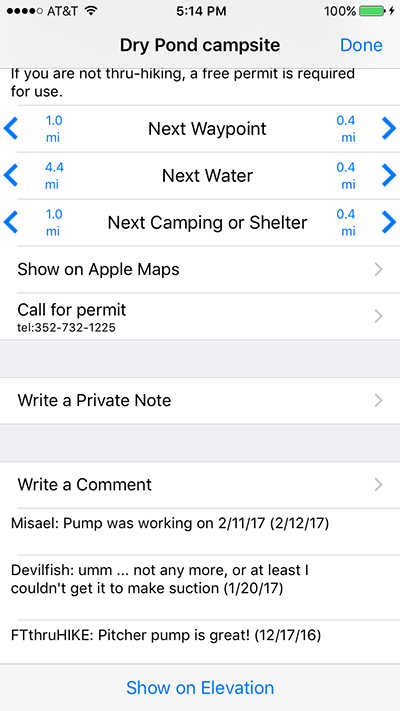 Leave notes in a virtual Trail Register that other hikers using the app can see, and that trail maintainers or FTA staff can respond to. Share photos from your own hike. Share your location on Facebook or Twitter, or simply into your Photos. Check on Trail Conditions and leave notes of your own about them to inform other hikers. Check on News Bulletins from land managers, the FTA, and us. An important feature of this app is ACCURATE MILEAGE. All of the mileage in the app is based on the actual GPS tracks collected to make the app, so waypoints are where they should be. This means, of course, that the app gradually gets out of synch with the mileage markers we provide in The Florida Trail Guide. However, it also means that we are keeping up with trail changes far more frequently than the average guidebook writers would, so when we go to release the next edition of the Florida Trail Guide, it will once again match mileage with the app. 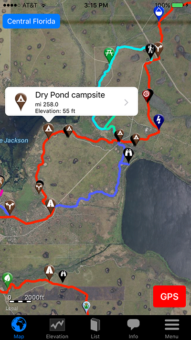 Loops and side trails are also included on these interactive maps, so you can also plan overnight and multi-day loops utilizing the Florida Trail and its connected side trails. We collect and share trail information. Atlas Guides does the technical magic. For tech support questions, including trouble with reloading your app after upgrading to a new phone, please email them.